California has always been one of the greenest and most progressive states in our nation. It was the first state to legalize medical marijuana; it was the first state to implement a state-wide plastic bag ban; and in 2019, it became the first state to ban plastic straws. California’s Proposition 65, also called the Safe Drinking Water and Toxic Enforcement Act, was enacted in 1986. It requires the state to publish an annually updated list of chemicals known to cause cancer, birth defects or other reproductive harm. What this means is that any product or service that may use one of approximately 1000 chemicals comes with a warning. 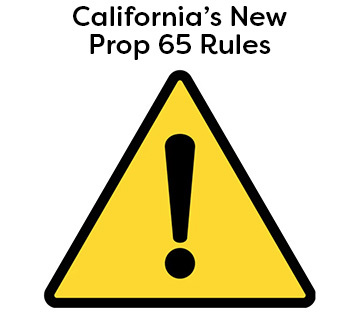 Prop 65 warnings are nothing new and are unalarming to most Californians. In California, you will find warnings at amusement parks, parking garages, dental offices and more. Even coffee now comes with a warning. Last year, a California superior court judge ruled that the coffee giant Starbucks and around 90 additional coffee vendors failed to comply with conditions set forth by Prop 65. While the decision is being appealed, some coffee retailers are posting Prop 65 warnings in compliance of the regulation. The FDA is in coffee retailers’ corners and in August issued a statement saying that putting Prop 65 warnings on food could violate federal law. In order for a product to be sold in California without a Prop 65 warning, the product has to go through strict testing measures to make sure the product does not contain any of the more than 1,000 naturally occurring and synthetic chemicals on California’s Prop 65 list. If a product is Prop 65 compliant and can be sold without a warning label, it means it has been tested and it does not contain any of the chemicals listed under Prop 65 or has numbers lower than Prop 65’s no significant risk levels (NSRLs)/safe harbor levels. Eco Promotional Products motto has always been “Your Safe Place for Environmentally & Socially Responsible Merchandise.” Year, after year, we strive to be better. We are in the process of updating our website so that every product is listed as Prop 65 compliant or it will come with a warning. Some products we offer simply haven’t been tested. While the product may not have any of the chemicals on Prop 65’s list, without proper testing, an untested product must carry a warning label. While these products are not considered Prop 65 safe, our factories take necessary steps to ensure that we are providing safe, quality products. Factories conduct periodic third-party testing of our products. This includes things like BPA in plastic, lead/formaldehyde content in bamboo, chromium in stainless steel, etc. As a precautionary measure and to be in full compliance of Prop 65, some of our factories are putting Prop 65 warnings on all products even when shipping outside the state of California. We always strive to be transparent with our customers and our goal is to tell you if the product you are ordering will come with a Prop 65 warning label. If you are a company in California, we can guide you through your purchases to make sure you choose products without a Prop 65 warning. To learn more about California’s Proposition 65 and the chemicals on the list click here.